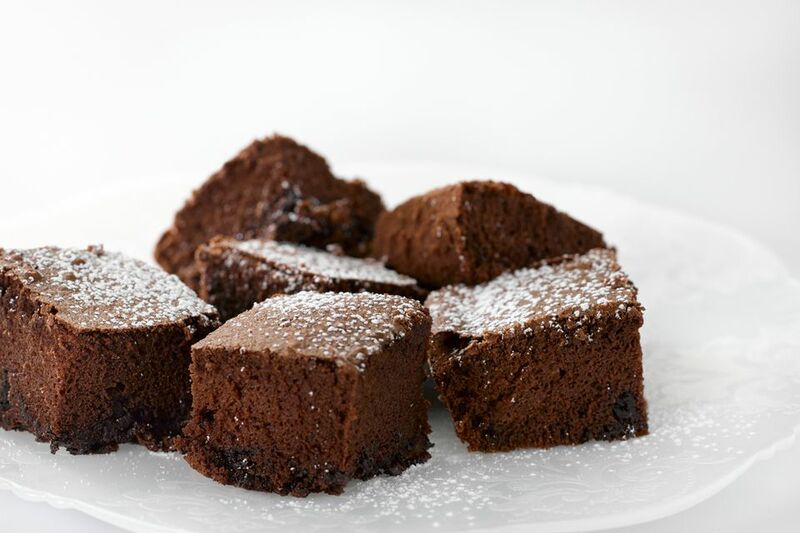 The original version of these Guinness Stout brownies was developed in Ireland. The malt in the Guinness Stout beer intensifies the flavor of the chocolate in these delicious brownies. The texture is an interesting combination of fudge, mousse, candy, and traditional brownies. Although they are decadent chocolate, they are surprisingly light due to the eggs. You won't taste the beer at all. These brownies are great for St. Patrick's Day or any day. As a bonus, you won't be using the full bottle of beer, so you might just enjoy a tipple as they are baking. Preheat the oven to 375 F. Line a 9-inch by 13-inch baking pan with nonstick foil. Dry Ingredient Mixture: In a medium bowl, whisk together flour, cocoa powder, and salt until evenly combined. Set aside. Chocolate Mixture: Melt butter, bittersweet chocolate, and white chocolate chips in a double-boiler over very low heat, stirring constantly until melted. Remove from heat. Mix the Eggs and Sugar: In a large mixing bowl, beat eggs and sugar on high speed until light and fluffy, about 3 minutes. Add melted chocolate mixture to the eggs and sugar mixture, beating until combined. Beat the reserved dry ingredient mixture into the melted chocolate mixture. Whisk in the Guinness Stout beer by hand. The batter may seem a bit thin. Pour the batter into the prepared baking pan. Drop semisweet chocolate chips evenly on top of batter (some will sink in). Bake 25 to 30 minutes (oven temperatures vary) on center rack in the oven, until a toothpick inserted in the center comes out clean. Let the brownies cool, uncovered, to room temperature. The Guinness Stout beer should be at room temperature. This recipe uses less than a standard 12-ounce bottle of Guinness Stout beer. Pour the beer early so the foam can settle. Do not include the foam in the measurement. Either spoon off the foam or let it rest until the foam subsides. What you do with the rest of the bottle of beer is up to you. You could enjoy a quaff before or after your baking session.